to be held at Duke University, Durham, North Carolina from Feb 8 to Feb 10 2017. The workshop is part of the long-year program on optimization currently taking place at the Statistical and Applied Mathematical Sciences Institute (SAMSI). There will be a lineup of invited speakers from the forefront of Statistics and Optimization each of which has made influential contributions to the other field as well. The planning is still ongoing, and hence, the list of speakers will grow some. If you can’t make it to North Carolina next February, still mark the date since the talks will be broadcasted via the net and (if tech works out) you may even participate in the Q&A sessions after the talks via your computer. i.e. the initial datum is just transported in direction of , as the name of the equation suggests. We may also view the solution as not only depending on space and time but also dependent on the velocity , i.e. we write . In the case of a Gaussian distribution , i.e. In other words, velocity averaging and time rescaling turn a transport equation (a hyperbolic PDE) into a diffusion equation (a parabolic PDE). I’ve seen this derivation in a talk by Enrique Zuazua in his talk at SciCADE 2015. 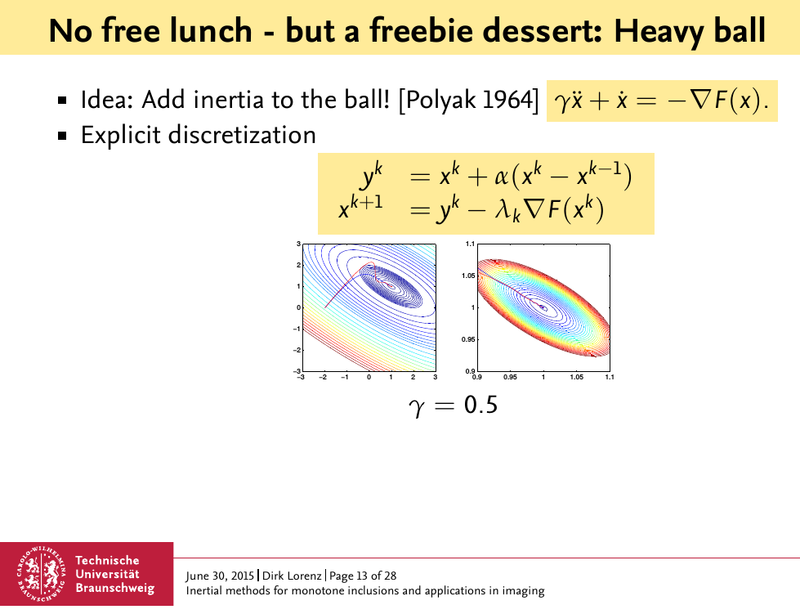 I am at at IFIP TC7 and today I talked about the inertial primal-dual forward-backward method Tom Pock and I developed in this paper (find my slides here). I got a few interesting questions and one was about the heavy-ball method. Hence, you have indeed a perturbed gradient descent and the perturbation acts in a way, that it moves the minimizer of the objective a bit such that it lies more in the direction towards which you where heading anyway and, moreover, pushes you away from the previous iterate . This nicely contrasts the original interpretation from~(1) in which one says that one takes the direction coming from the current gradient, but before going into this direction move a bit more in the direction where you were moving. for some . This will give you strong convexity of and an that is (often) theoretically no worse than it used to be. It appeared to me that this is an idea that Kristian Bredies told me already almost ten years ago and which me made into a paper (together with Peter Maaß) in 2005 which got somehow delayed and published no earlier than 2009.
for functions and sets . One further classifies problems according to additional properties of and : If one speaks of unconstrained optimization, if is smooth one speaks of smooth optimization, if and are convex one speaks of convex optimization and so on. For general problems one can of course desire to be within a certain distance to the optimal point , i.e. for the solution and a given point . One could also demand that one wants to be at a point which has a function value close to the optimal one , i.e, . Note that for this and for the first point one could also desire relative accuracy. For convex and unconstrained problems, one knowns that the inclusion (with the subgradient ) characterizes the minimizers and hence, accuracy can be defined by desiring that . It turns out that the first two definitions of accuracy are much to hard to obtain for general problems and even for smooth and unconstrained problems. The main issue is that for general functions one can not decide if a local minimizer is also a solution (i.e. a global minimizer) by only considering local quantities. Hence, one resorts to different notions of accuracy, e.g. For a smooth, unconstrained problems aim at stationary points, i.e. find such that . For smoothly constrained smooth problems aim at “approximately KKT-points” i.e. a point that satisfies the Karush-Kuhn-Tucker conditions approximately. (There are adaptions to the nonsmooth case that are in the same spirit.) Hence, it would be more honest not write in these cases since this is often not really the problem one is interested in. However, people write “solve ” all the time even if they only want to find “approximately stationary points”. That’s already a result on the iteration complexity! Among the first iterates there is one which has a gradient norm of order . However, from here on it’s getting complicated: We can not say anything about the function values and about convergence of the iterates . And even for convex functions (which allow for more estimates from above and below) one needs some more effort to prove convergence of the functional values to the global minimal one. (which is a continuous limit of the gradient method as the stepsize goes to zero). A physical intuition about this dynamical system in is as follows: The function describes a landscape and are the coordinates of an object. Now, if the landscape is slippery the object slides down the landscape and if we omit friction and inertia, the object will always slide in the direction of the negative gradient. Consider now a favorable situation: is smooth, bounded from below and the level sets are compact. What can one say about the trajectories of the ? Well, it seems clear that one will arrive at a local minimum after some time. But with a little imagination one can see that the trajectory of does not even has to be of finite length! To see this consider a landscape that is a kind of bowl-shaped valley with a path which goes down the hillside in a spiral way such that it winds around the minimum infinitely often. This situation seems somewhat pathological and one usually does not expect situation like this in practice. If you tried to prove convergence of the iterates of gradient or subgradient descent you may have noticed that one sometimes wonders why the proof turns out to be so complicated. The reason lies in the fact that such pathological functions are not excluded. But what functions should be excluded in order to avoid this pathological behavior without restricting to too simple functions? Here comes the so-called Kurdyka-Łojasiewicz inequality into play. I do not know its history well, but if you want a pointer, you could start with the paper “On gradients of functions definable in o-minimal structures” by Kurdyka. for all such that . To see that, take and evaluate the gradient to to obtain . This also makes clear that in the case the inequality is fulfilled, the gradient provides control over the function values. The works of Łojasiewicz and Kurdyka show that a large class of functions fulfill the respective inequalities, e.g. piecewise analytic function and even a larger class (termed o-minimal structures) which I haven’t fully understood yet. Since the Kurdyka-Łojasiewicz inequality allows to turn estimates from into estimates of it plays a key role in the analysis of descent methods. It somehow explains, that one really never sees pathological behavior such as infinite minimization paths in practice. Lately there have been several works on further generalization of the Kurdyka-Łojasiewicz inequality to the non-smooth case, see e.g. Characterizations of Lojasiewicz inequalities: subgradient flows, talweg, convexity by Bolte, Daniilidis, Ley and Mazet Convergence of non-smooth descent methods using the Kurdyka-Łojasiewicz inequality by Noll (however, I do not try to give an overview over the latest developments here). Especially, here at the French-German-Polish Conference on Optimization which takes place these days in Krakow, the Kurdyka-Łojasiewicz inequality has popped up several times. The second day of SSVM started with an invited lecture of Tony Lindeberg, who has written one very influential and very early book about scale space theory. His talk was both a tour through scale space and a recap of the recent developments in the field. Especially he show how the time aspect could be incorporated into scale space analysis by a close inspection of how receptive fiels are working. There were more talks but I only took notes from the talk of Jan Lellmann who talked about the problem of generating an elevation map from a few given level lines. One application of this could be to observe coastlines at different tides and then trying the reconstruct the full height map at the coast. One specific feature here is that the surface one looks for may have ridges which stem from kinks in the level lines and these ridges are important features of the surface. He argued that a pure convex regularization will not work and proposed to use more input namely a vector field which is derived from the contour lines such that the vector somehow “follows the ridges”, i.e. it connects to level lines in a correct way. Finally another observation I had today: Well, this is not a trend, but a notion which I heard for the first time here but which sounds very natural is the informal classification of data terms in variational models as “weak” or “strong”. For example, a denoising data term is a strong data term because it gives tight information on the whole set . On the other hand, an inpainting data term is a weak data term because it basically tell nothing within the region . and to Schloss Kronberg for the conference dinner (although it was pretty tough to start eating the dinner after visiting Zotter…). I am at the SSVM 13 and the first day is over. The conference is in a very cozy place in Austria, namely the Schloss Seggau which is located on a small hill near the small town Leibnitz in Styria (which is in Austria but totally unaffected by the floods). The conference is also not very large but there is a good crowd of interesting people here and the program reads interesting. The time schedule is tight and I don’t know if I can make it to post something everyday. Especially, I will not be able to blog about every talk. Differential geometry: Tools from differential geometry like the notion of geodesics or Riemannian metrics have not only been used by Martin Rumpf to model different types of spaces of shapes but also to interpolate between textures. Primal dual methods: Variational models should be convex these days and if they are not you should make them convex somehow. Then you can use primal dual methods. Somehow the magic of primal dual methods is that they are incredibly flexible. Also they work robustly and reasonably fast. Probably, there are more trends to see in the next days.